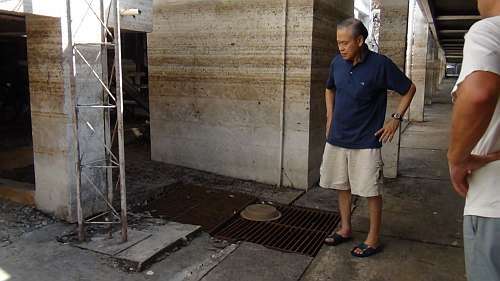 After over five weeks of inundation by flood water at the Asian Institute of Technology campus at Kilometre 42 on Phaholyothin Road, a team of RAST members led by station manager Finn, OZ1HET and President Chaiyong, HS1QVD visited the club station there on Saturday, December 10. 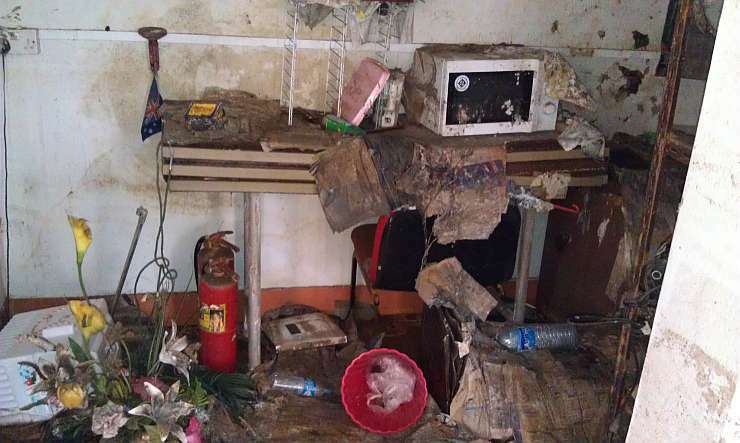 Others accompanying them included Swen, HS0ZFZ, Thida, HS1ASC, her daughter Shompoo, E20QMD, Karl, HS0ZJL and his XYL, Sonn, HS0NDK and Gerd, DK5FJ and they found that flooding had been almost to the ceiling (as can be seen from the water line in these pictures) while grass, plants and shrubs outside the station had died. 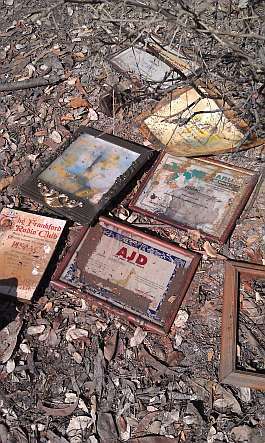 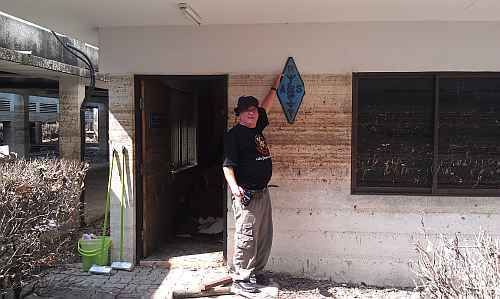 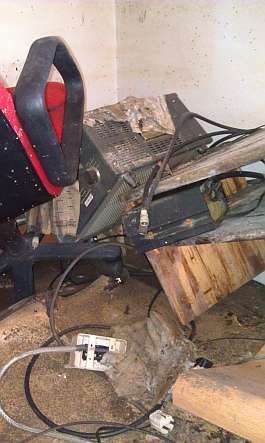 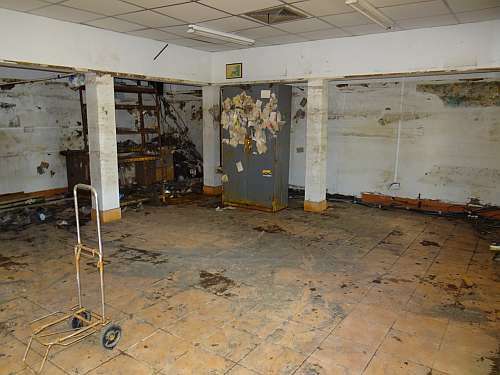 All the equipment and furniture in the "shack" had been ravaged by the floodwater as these photographs sadly depict. 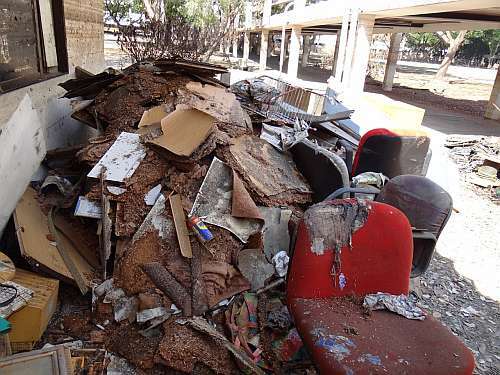 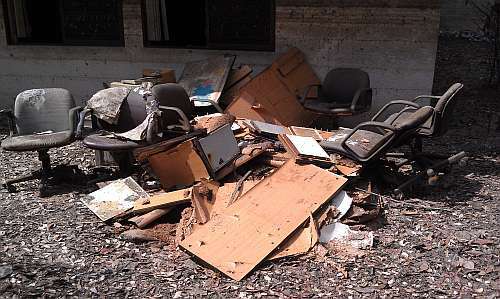 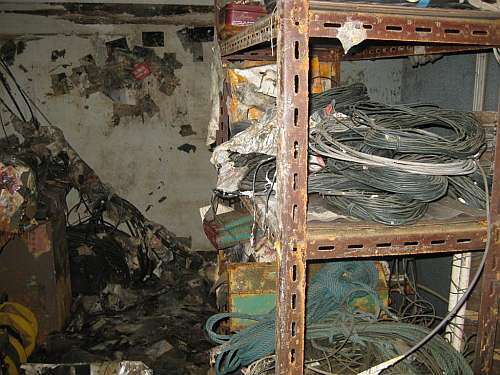 The team carefully removed everything in the HS0AC station, including cabling that had been submerged by the flood water and furniture, as well as the remains of desks that had collapsed under the weight of equipment and action of the corrosive water, seen here at right stacked up outside. 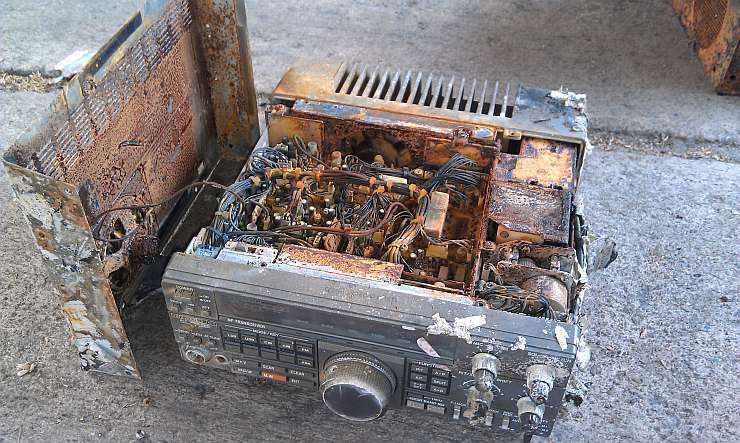 Station Manager Finn summarises the situation as follows: "The club station was completely destroyed, everything in there spoiled so we could only "scrap" all out as garbage. 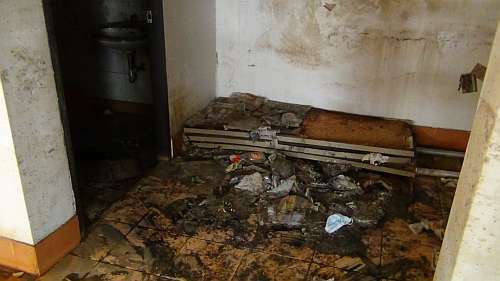 All furniture had fallen apart and everything was full of mud and smelling very bad." 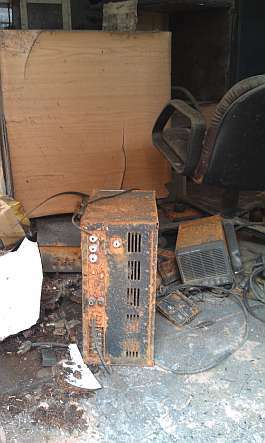 "I must say, it was far worse than expected," Finn noted in an email, adding: "This was a very, very bad experience, I can tell you." 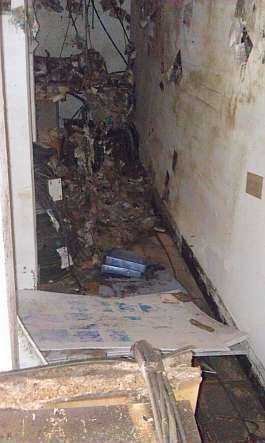 Above, the entrance to the bathroom and, at right, where the second operating position used to be. 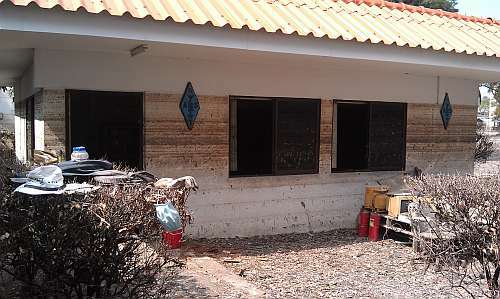 RAST belongings are lined up outside the shack (left) while RAST President Chaiyong looks at the base of one of the antenna towers at right. 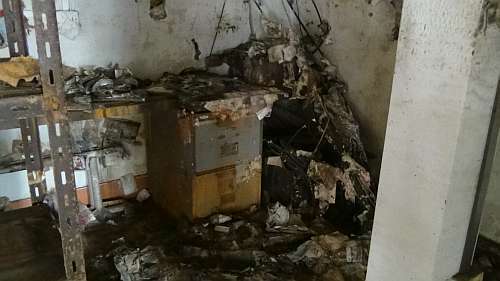 The team spent eight hours cleaning and clearing everything out and the equipment was retrieved for later inspection and possible salvage operations. 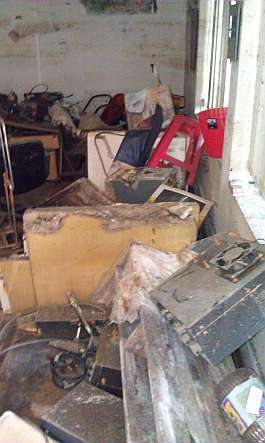 Most of the furniture at HS0AC is a write-off and some of the equipment (at right) may be beyond repair. 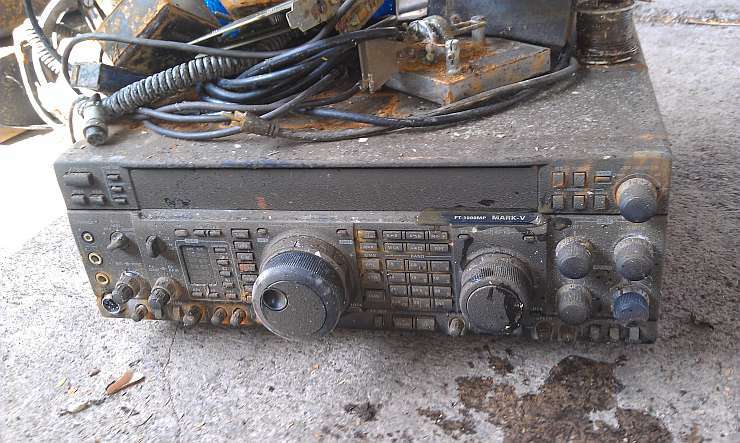 That's the club station's Yaesu FT1000MP at left and its Kenwood TS950S at right. 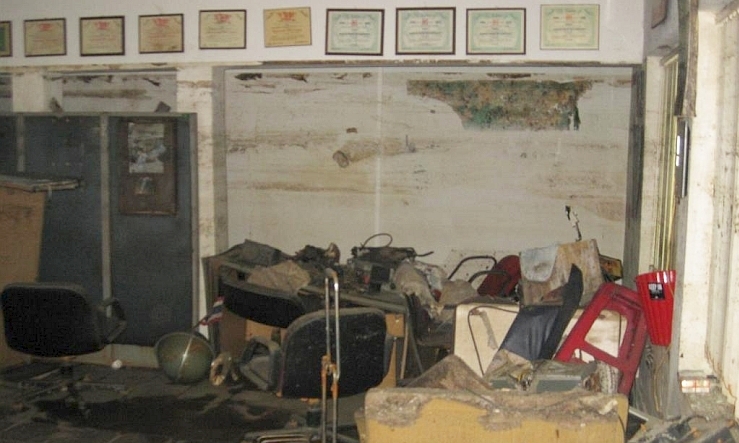 That's a Drake T-4XC under the murk and mud, while trophies and plaques were not spared flood damage. 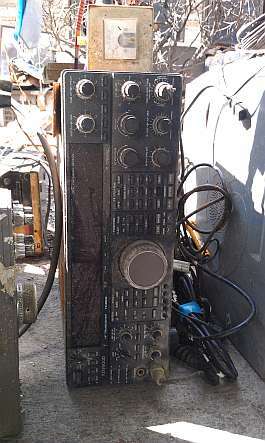 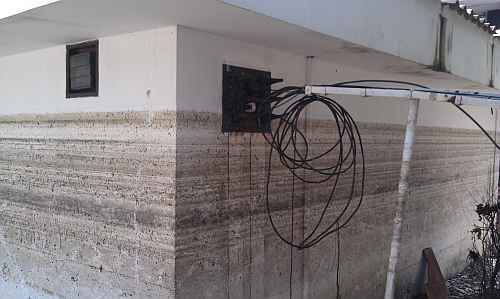 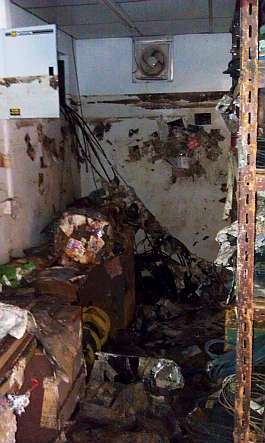 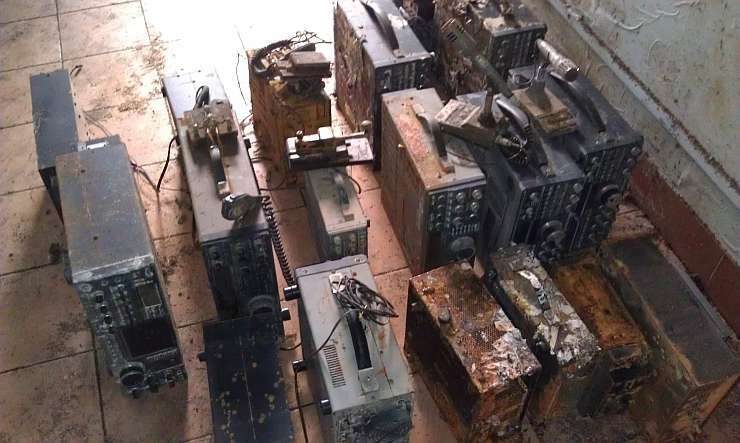 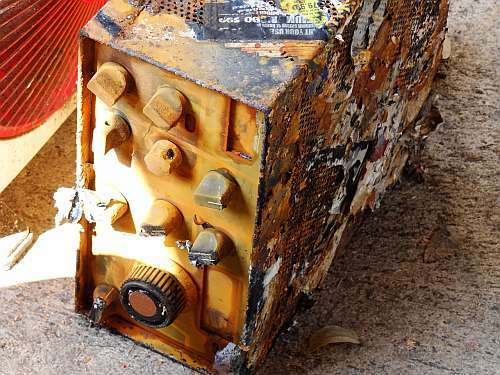 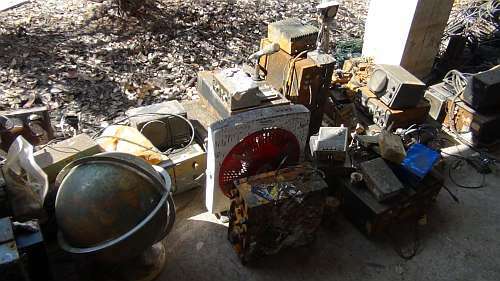 Please scroll down to see pictures of the damage such as this one (at right) showing the sorry state of several transceivers that were recovered from the HS0AC club station in early December 2011 following five weeks of flooding that reached a depth of two metres. 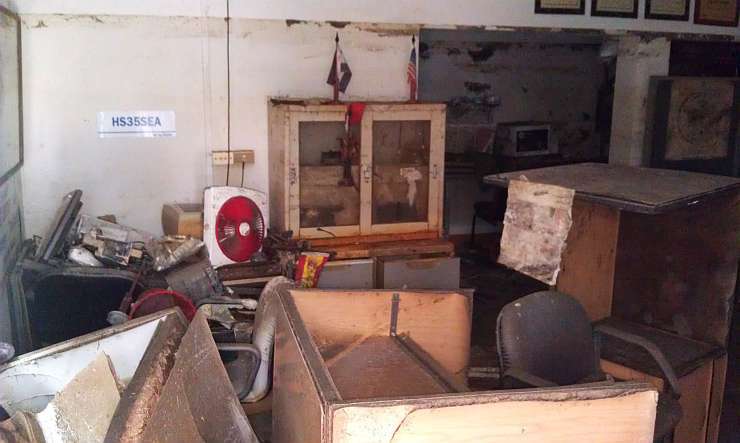 Moving the equipment up to be stored on the upper shelves in this cabinet at the club station in advance of the flooding was not enough to save it. 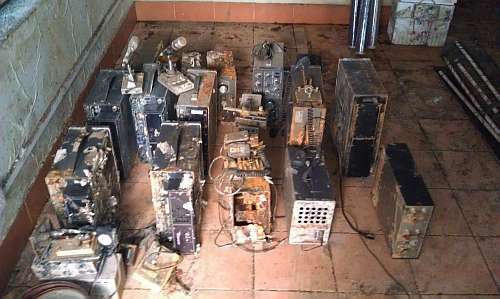 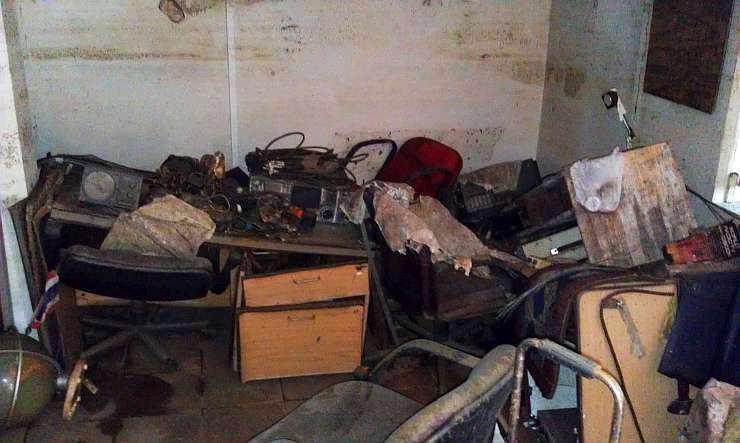 By the end of the day, the HS0AC shack was cleared of furniture and equipment: transceivers, cables, microphones, antenna tuners and other hardware was taken away to be examined and possibly restored. 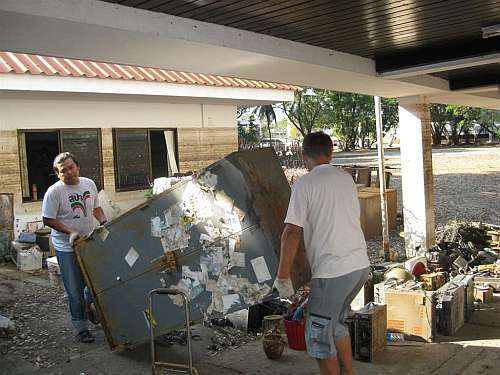 Above right: Sonn and Swen move out a steel cabinet, one of the last remaining items of furniture, late in the afternoon. 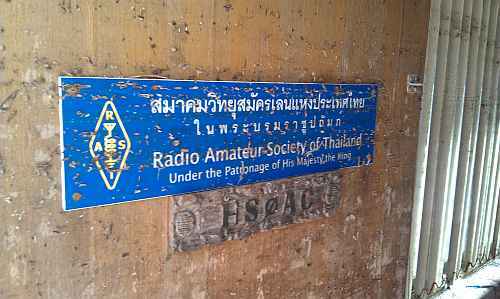 These pictures that tell this sad story here were mostly taken by Swen, HS0ZFZ, as well as by Karl, HS0ZJL and Thida, HS1ASC at AIT. 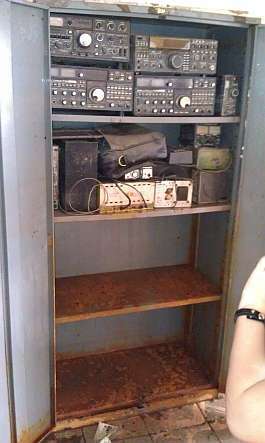 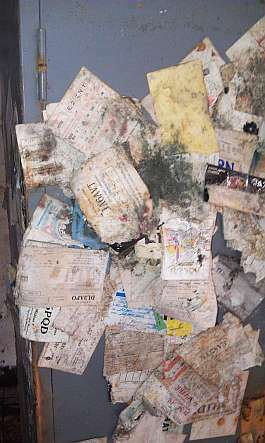 At left: this was the "first look" after the door to the club station was opened, while at right we can see QSL cards that used to adorn this cabinet inside the HS0AC club station but, like almost everything else in the station, they are history now. 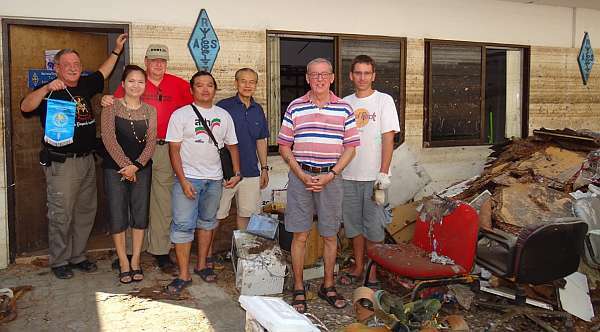 The photo at left shows the team outside the HS0AC shack on Saturday, December 10 from left: Gerd, Karl's XYL, Karl, Sonn, Chaiyong, Finn and Swen. 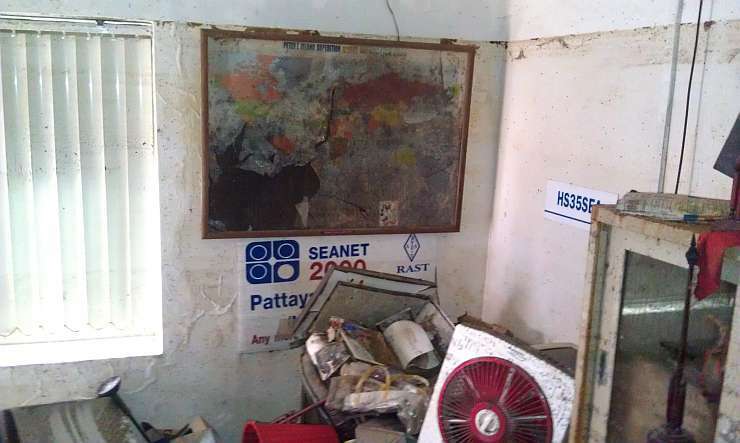 Thida was behind the camera.